Congratulations to the Incoming 2018-2019 PILA Board!! PILA would like to thank the outgoing board for everything they have done for the UVA Law public service community, and congratulate next year's board on their election. Looking forward to a great year! We are very pleased to announce that Tex Pasley and Amber Strickland will receive this year's Claire M. Corcoran Awards. Both students, who incidentally were recently elected co-presidents of the Law & Public Service program, have had a stellar impact both in the Law School and beyond. Tex has worked on an extraordinary range of issues through his pro bono work with a diverse group of organizations—including the Innocence Project, the No Exception Prison Collective, the Virginia Legislative Committee on Mental Health, and the Legal Aid Justice Center. In addition to the LPS Board, he has been a leader in the National Lawyers Guild and a co-founder of the Virginia Law Prison Project. He spent his first summer working for Colorado Legal Services and will work this summer with the Sargent Shriver National Center on Poverty Law in Chicago. In the words of one recommender, "Through his amazing work so far, Tex has helped countless clients retain their homes, jobs, and rights, and has helped countless law students become better public interest advocates. His enthusiasm is infectious[.]" Amber spent the year before law school working with the International Justice Mission in Bangalore, India, combatting forced labor slavery. She remains involved with that organization, and has also worked many hours with the Innocence Project here. As an LPS Board Member this year, she launched the Program's blog. She has also been a leader in BLSA, traveling to Uganda on a service trip during 1L and organizing this year's trip to South Africa. Her first summer was with the Civil Rights Section in the U.S. Department of Justice and this coming summer she'll work for the Racial Justice Program with the American Civil Liberties Union. One recommender writes: "There are very few people that I admire in this world more than Amber, primarily because her work product is impeccable, her kindness is selfless, and her character is unparalleled. She is not only passionately dedicated to public service, but passionately dedicated to shining her light brightly to make the world a better place through her love and grace." Please join us in congratulating Tex and Amber and thanking them for all the great work that they do. Thanks also to everyone who submitted nominations and those who served on the selection committee. PILA is now accepting applications for the 2016–17 Board! The application is attached. Why should I join the PILA Board? -The work I've had a chance to do over the last two years, first as an auction director and this year as president, has been some of the most rewarding and meaningful of my three years here. The PILA Board gives you a unique chance to impact both individual student experiences and policy for the entire school. -The people you meet—other Board members, grantees, community partners, and faculty—are inspiring, dedicated public servants. Learning from them and their stories is a tremendous opportunity. -It's a lot of fun! We throw the biggest party of the fall semester and it's a great way to expand your network of friends during your last two years here. -Added bonus: if you're a PILA grantee it substitutes for your 20 hour obligation to PILA. But note that you do not have to be a grantee to join the Board! 1) A written portion, consisting of (a) your resume without GPA data and (b) a 1–3 page Word doc answering the questions posed in the attached application. These must be submitted to me at this email address (reedyswanson@gmail.com) by 5 pm on Thursday, March 17. 2) An interview lasting approximately 10 minutes, to take place on Monday, March 21. The newly elected Board should plan to meet at least once or twice in April. Each spring we request nominations for the Claire M. Corcoran Award. The Award was established in 1990 with the creation of a memorial fund established in memory of Claire M. Corcoran, a graduate of the Law School's Class of 1989 who passed away suddenly on December 20, 1989. The Corcoran Award is presented to one or two 2L students who have demonstrated, as Ms. Corcoran did, an exceptional commitment to public service. In addition to the honor of being designated as the Corcoran Award recipient, the selected student will receive a cash prize of $1,500; should two students receive the Award, they will receive $750 each. Students, staff and faculty members who wish to nominate a 2L student should submit a written statement of no more than 500 words to Sejal Jhaveri, PILA President, at spj4ea@virginia.edu by Wednesday, April 8th, 2015. Among other things, the statement may address the nominee's pro bono work, his/her summer work in public service law, relevant information about the work (volunteer or otherwise) the nominee did before law school, and the nominee's career goals. A panel of students and administrators will decide the Claire Corcoran recipient(s). Thank you in advance for your thoughtful nominations! PILA is now accepting applications for the 2015-2016 Board. Completed applications are due along with a resume by Friday, March 20, 2015 at 5pm to Sejal Jhaveri. Interviews will be scheduled for Wednesday, March 25, 2015. Mark your calendars! PILA's annual Spring Service Day is back! What: Volunteers will be helping out at various organizations, including Camp Holiday Trails, the Loaves and Fishes food pantry, Madison House, and the Virginia Institute of Autism (VIA). Interested in volunteering? Contact Megan Durkee at mmd6a@virginia.edu no later than Wednesday, February 18. Please Donate to the PILA Auction! The Public Interest Law Association (PILA) is a student-run organization that provides grants for UVA law students who work in low or unpaid public interest jobs during the summer. PILA was able to fund 99 students last year. 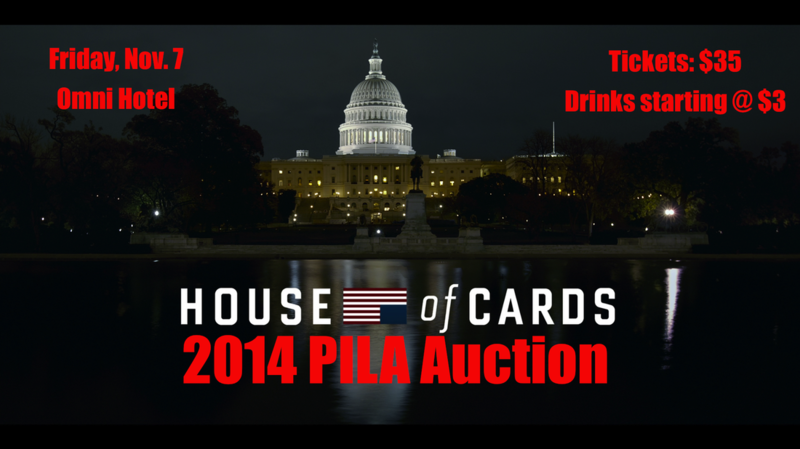 The annual PILA Auction is our biggest fundraiser of the year. Generous contributions from students, faculty and staff, and local businesses are essential to the ongoing success of this event. We invite you to contribute this year! To donate, please fill out an auction contract and send it to virginiapilaauction@gmail.com or mail it to the following address: Public Interest Law Association, c/o Auction Directors, University of Virginia School of Law, 580 Massie Road, Charlottesville, VA 22903. All donations are tax deductible.